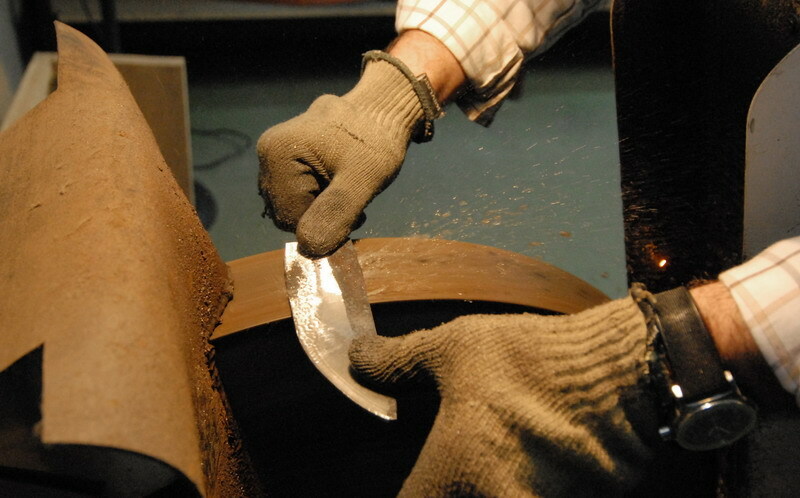 Basically, a knife is a cutting tool, and we concentrate our efforts in this simple fact. This is a starting point, from which we try very hard to make our knives as beautiful as possible, within the style we have chosen, and without loosing practicality and ergonomics. 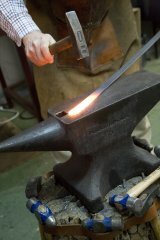 All our knives are handforged (you won´t find any mechanical drop hammers in our shop), starting from bars of high-quality toolsteels traditionally being used in American custom kinfemaking, e.g. O1 and 52100 types. These steels, properly heat-treated, offer optimal characteristics which other modern steels can rarely outperform. Edge retention and the easiness with which you can restore it are extraordinary thanks to the convex grind "apple seed" and heat treatment given to the blade. We usually get a final hardness of about 56-57 RC, which we feel is absolutely enough for a general use of a hunting knife. 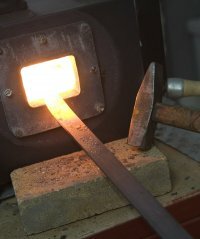 We started working with a traditional carbon forge and making our own heat treatment by eyeballing, employing the traditional way of discovering temperatures by paying close attention to the changing colors of the steel as it is subjected to heat. 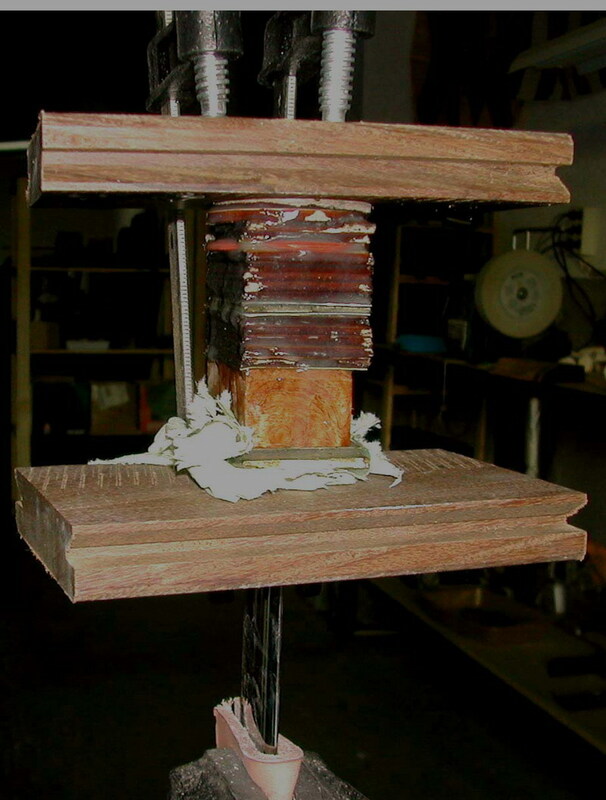 This kind of work gave us a most valuable experience, but our efforts to excel in our work moved us to upgrade the system, changing for a gas driven forge, and making our heat treating in a precision electric furnace (which gives us a closer + - 2 C spread temperature control). 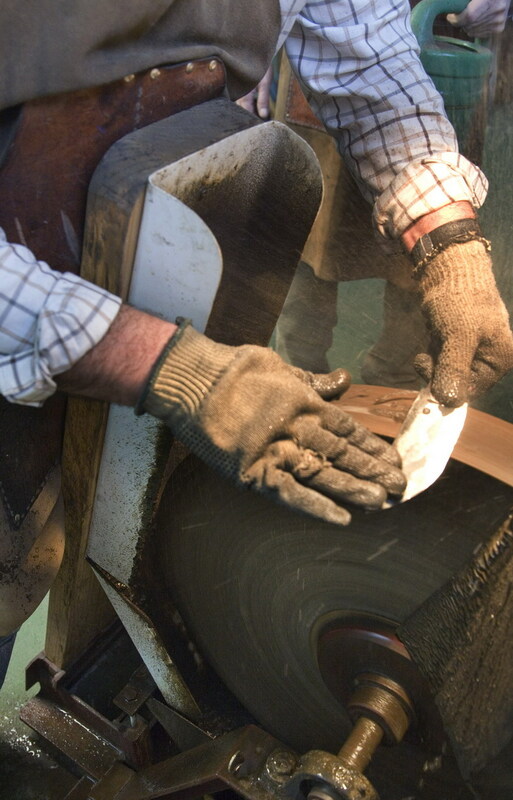 In this way, we can guarantee a minimal stress for the steel, and an exact control of this critical treatment of our blades. 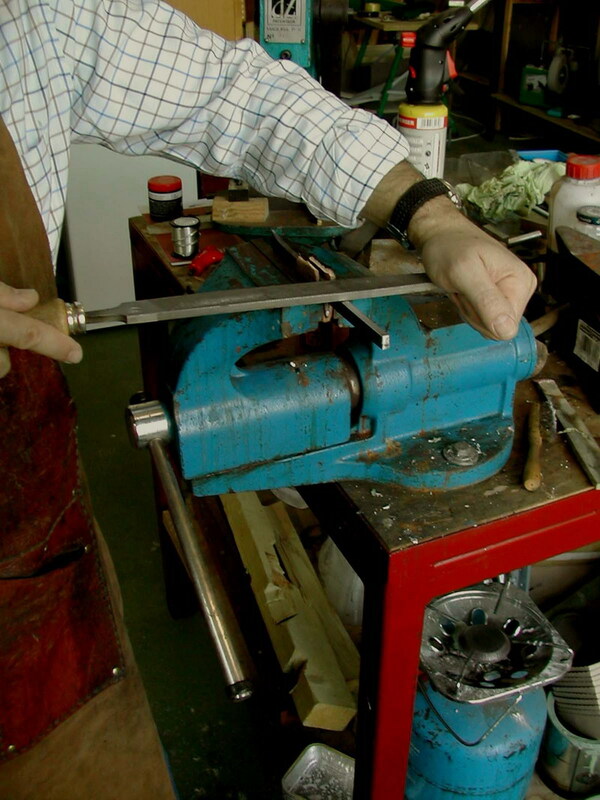 Following as close as possible the self sufficient behaviour of our inspirer W. Scagel, we make our own grinding and polishing wheels, as well as our polishing compounds. 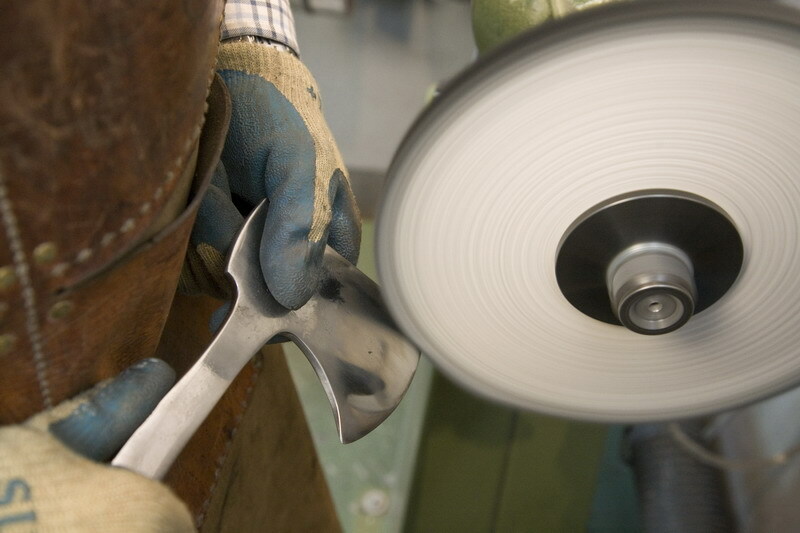 The handles of our knives, just as the blades, are never identical. We begin with a brass or nickel silver guard, which is carefuly silver-soldered to the blade. Then, the handle is formed with a group of spacers of different materials (brass, nickel silver, vulcanized fiber, etc.) forming a pattern, together with leather washers, which are strongly pressed and finished on top with a stag crown, riveted to the tang. We also like to include in our handles, some spacers made of nice grained hard woods, such as ironwood, lignum vitae, ebony, granadillo, rosewood, etc..
We also hand make our own sheaths. 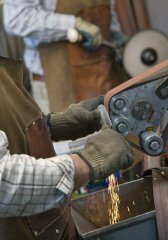 We consider the knife and sheath combination as a whole, in order to be able to offer a completely hand-finished, custom-made final product displaying craftmanship, quality and esthetical value as a unit. The sheaths are hand-carved or tooled, employing first-quality Hermann Oak leathers, of 9-10 oz weight, following several distinct traditional American patterns. 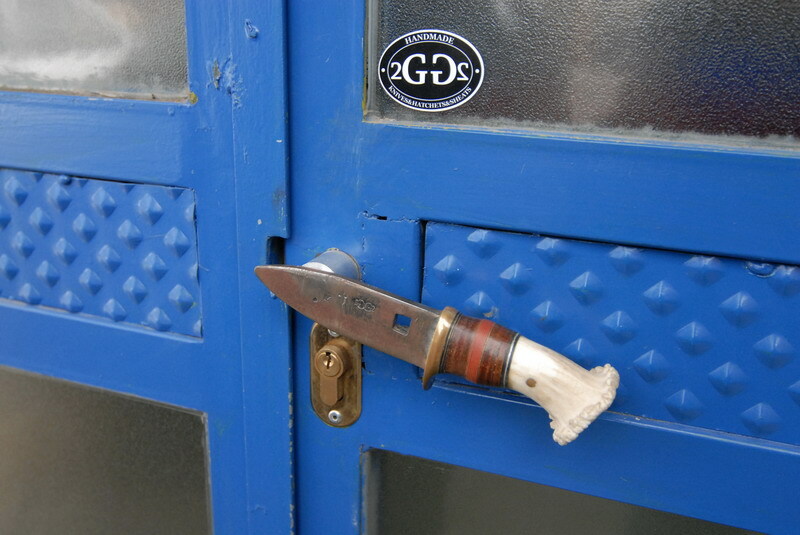 The sheaths are also hand sewn, using natural linen thread (5 ply). They can be antique finished or left natural, but in any case, all of them are completely treated with special long lasting products which make them water repelent. Pepin Vives especially enjoys making the western style known as "Sheridan".